The Exotics E8 Exotics Hybrid from Tour Edge is a technologically-advanced adjustable hybrid. Featuring a 450 stainless hyper steel body plasma welded to a forged cup face, this hybrid delivers exceptional power. The Tour Edge Power Grid behind the face generates increased flexing of the face at impact. This translates into more spring-like effect and more distance. More control and power at impact is possible thanks to the deep cut away steps positioned back in the heel and toe of the sole that makes shaping shots off the tee and the turf easy. The steps increase the moment of inertia (MOI) and maximizes stability on off-centre contact while minimizing turf drag. The Exotics E8 hybrid also has the ability to change the centre of gravity (CG) with an interchangeable sole weight. This allows you to dial in your preferred trajectory. The standard sole weight is 9 grams, but additional weights can be bought in a three piece weight kit that includes 6g, 11g and 14g weights. This Tour Edge engineering produces a high launching hybrid that lands soft for precision. The hybrid has an understated, shallow face profile appearance with its sharp turn at the toe and a matt black finish to reduce glare. The alignment aid, a white “E”, marks the sweet spot. 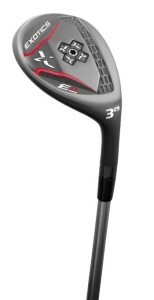 The sole of the E8 hybrid holds the Power Grid that runs parallel to the club face. Having a centralized weight on the sole of the E8 makes the intentions of lower/centralized CG quite visible. A smooth yet sturdy feel in play. Strong and stable impact with informative feedback. The shaft matches the weighty head with automatic release after impact. The sound of the Exotics E8 Hybrid is sharper and livelier than a typical iron and is only dulled when impact is very low on the face. The E8 hybrid is powered with UST Mamiya Recoil graphite shafts that deliver great feel in lightweight options. The Tour Edge Exotics E8 hybrid is easy to use. The hybrid will rescue you from deep rough and get you to the short grass. While the “power grid” takes on some grass when the club is driven into the ground, it wipes away easily. A good swing and square contact will give you precise results. The Tour Edge makes light work of long carries, you can add five to ten yards past what you have in your bag now. The Tour Edge Exotics E8 hybrid will produce surprisingly straight shots with mis-hits. It is easy to work the ball and mis-hits will lose only marginal distance from expected totals. The Tour Edge Exotics E8 hybrid is a hybrid that can be both forgiving and workable in the hands of many golfers. The Exotics E8 hybrid packs power and precision into one of the more versatile heads in its class. Women’s length -1″ from men’s standard listed. Standard stock grip option is Lamkin Exotics R.E.L. Get Tour Edge Exotics E8 Hybrid Now!